As of version 2.3 for the “pro” plugin and version 2.2 of the “free” version, several tools are available to help you collect and manage registrations for your events in a GDPR compliant way. Do you interact with members of the EU? Read on to find out how to enable these and start using them. Please note: Using these tools DOES NOT GUARANTEE YOU FULLY COMPLY WITH GDPR. PLEASE CONTACT A GDPR CONSULTANT OR LAW FIRM TO ASSESS NECESSARY MEASURES. 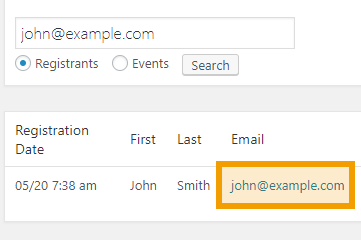 The “My Events” feature added in 2.3 not only allows for more convenient event management for users of your site but can also be used by site administrators to manage personal data of attendees. This feature has always been available in the “pro” version of the plugin. You can create a checkbox form field with a single option, then add a link to a relevant page containing information about your terms and conditions. You would then want to make this form field required. See this explained in more detail, with screenshots, on this page. Find the explanation in the Special Fields section. To view all available registration data attached to a specific email address, use the search bar at the top of the “Registrations” tab. 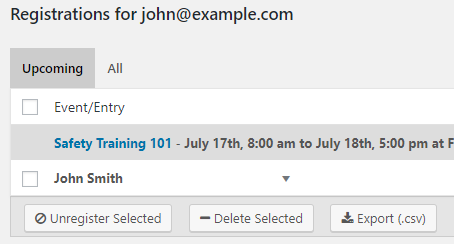 After entering the email address, if search results are returned, you’ll be able to click on one of the email addresses to view all related registrations. Use this page to delete or export data attached to this email address. Separating registration data by email address and allowing your attendees to opt-in to terms and conditions are both possible with version 2.2. On the “Form” tab, you can now find a setting to enable a “terms and conditions” checkbox. There are options to set up a link along with a label for the link to a privacy page or a page explaining the terms and conditions of registering for an event by submitting personal data. To view all available registration data attached to a specific email address, use the search bar at the top of the “Registrations” tab. After entering the email address, if search results are returned, you’ll be able to click on one of the email addresses to reveal more options. 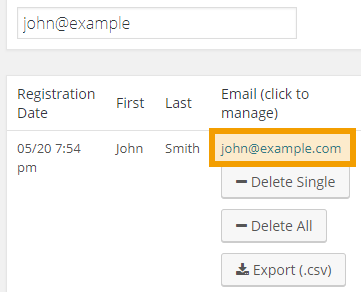 Click on “Delete Single” to delete just a single registration, “Delete All” to delete all registrations attached to that email address, and “Export (.csv)” to export all data attached to registrations that use that email address. Please contact support if you have additional questions about how the plugin handles data.